How we helped one business improve its staff recruitment policy and increase employee retention across the business. Launched in 2009 and headquartered in Reading, Workbooks delivers cloud-based CRM and business applications to growing and mid-market organisations. It currently has over 1,400 customers in over 50 countries and employs 60 staff across sales, marketing, professional services, support, engineering, finance and administrative roles. Since its inception, Workbooks had managed its HR in- house. However, as the company grew it found hiring and retaining top-quality talent was becoming more challenging. Individual line-managers were tasked with recruiting, which in turn was costing the business hundreds of thousands of pounds in recruitment fees. • Intelligent recruitment – identifying the right fit of individual for the business (cultural, aptitude and potential), onboarding successful hires so that they have the best experience resulting in great sustained enthusiasm for their role and the business and reducing the reliance on recruitment agencies and fees. • Retention – developing career development strategies for all levels of the business and putting these plans in place. Coaching managers in how to get the best out of the team and their staff. Coaching staff in how to be best in their role. • Leadership and management – helping the executive management team collaborate more effectively in a busy, constantly changing environment. Workbooks decided to engage with an HR consultancy, looking for a partner that would offer processes appropriate it to its size and growth, but also with direct experience in the IT / software sector to fully appreciate the nuances and challenges of the business. It also ideally wanted a partner in the Reading locality who could provide ongoing support at both an operational and leadership level. Bespoke HR assigned a dedicated HR consultant to Workbooks who was able to work as part of the business. A year-long strategy was put in place to address the three key objectives. Work began with an initial audit of the existing recruitment process to identify where improvements could be made, and money saved. As a result, a strategy was created to increase the quality of hires and improve the onboarding process. Bespoke HR assigned an additional consultant to specifically manage recruitment, acting as in-house recruiter on behalf of Workbooks. A standardised recruitment process was established to ensure all employees were being offered the same benefits across the business. A two-pronged recruitment approach meant that initial activities focused on direct recruitment through online advertising and LinkedIn Recruiter. A preferred supplier list was created of recruitment agencies as a back-up, and a flat fee negotiated across all. An audit was conducted of the performance process and all activity was taken online using Bespoke HR’s custom-build PDR Cloud review system. To gauge staff morale and opinions, Bespoke HR conducted a staff survey using its online questionnaire tool customised with Workbook’s branding. Weekly HR clinics were held each week, open to all employees to discuss HR matters including career progression, development, welfare and relations. Bespoke HR introduced leadership and team development training solutions to realise and release the potential of individuals and teams. • Recruitment costs reduced dramatically. 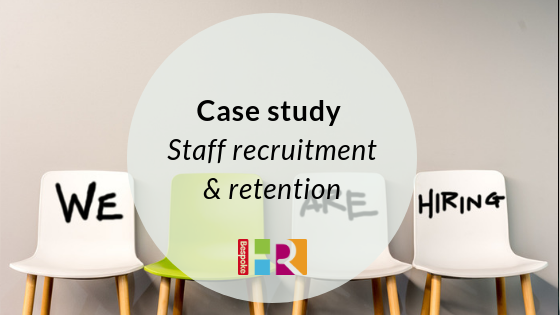 In a nine- month period, Bespoke HR offered seven roles, and as a result of the new process saved the business approximately £20k on recruitment fees and admin time. • Improvement in staff retention rates. Turnover has reduced to 0% in the past nine months. All recruitment activity is now focused on new roles created by the growth of the business. • Staff morale has increased. The results of the staff survey called for more communication and collaboration between teams. As a result, staff now receive a monthly newsletter and take part in regular team building events and activities. • Feedback has been positive on the HR clinics, which have been well utilised, and staff have commented on the benefits of being able to confidentially raise any issues they have with the HR consultant. • Senior managers are more motivated with defined career paths as a result of external development training. Get in touch for a chat to see how we can improve staff retention and recruitment at your business. Bespoke HR Ltd was established in 2005 and offers a professional, pragmatic and independent human resources consultancy and outsourcing services. Bespoke HR offers expert bespoke solutions to support your individual business needs.